Fernando Morais discusses OS ÚLTIMOS SOLDADOS DA GUERRA FRIA. Fernando Morais promotes Os últimos soldados da Guerra Fria. Fernando Morais's book A Warrior's Life: A Biography of Paulo Coelho was available from LibraryThing Early Reviewers. 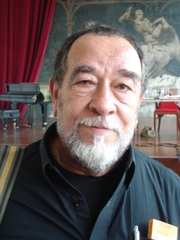 Fernando Morais is currently considered a "single author." If one or more works are by a distinct, homonymous authors, go ahead and split the author. Fernando Morais is composed of 3 names. You can examine and separate out names.